The ball spline has load groove of three row on the outside diameter of shaft. Due to the Gothic arch groove design, it could be make sure three grooves withstand clockwise or Counterclockwise of torque , and then increase the service life and rigidity. 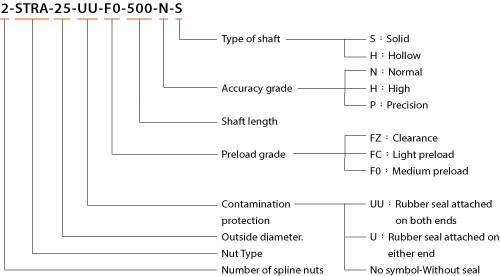 The Spline nut has a special designed support bearing directly set up on the outer ring of the nuts. The Spline is capable of performing two modes of motions (rotational and linear) with a single shaft by rotating or stopping the spline nut. The rows of balls are held in a special resin retainer incorporated in the spline nut so that they smoothly roll and circulate. The balls recirculation in ball holder, prevent balls falling from the spline nut while assembling. The spline nut and the support bearing are integrated, thus the Rotary Ball Spline can easily be mounted simply by securing it to the housing with bolts. The support bearing of the Ball Spline has a contact angle of 45°, thus it has the average force of axial and radial direction.